What do Albert Einstein, Pablo Picasso, and Queen Elizabeth II all have in common? 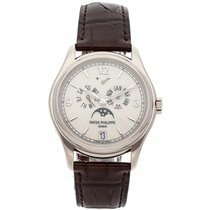 All of them were proud owners of Patek Philippe timepieces. It only makes sense that some of the most esteemed people to ever grace this earth should wear the most esteemed brand to ever make wrist watches. Perhaps Einstein appreciated their mechanical ingenuity. Picasso their style. The Queen their sheer splendor. Truthfully, it's the utmost refined consideration for all three aspects of watchmaking that distinguishes the brand from all the rest. 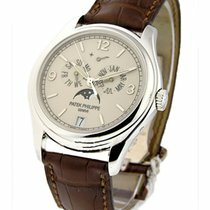 Our offering, the Patek 5146G-001 Annual Calendar features a highly intricate annual calendar and moon phase, as well as a power reserve and date. These elements are nestled on a lovely cream-colored dial which are all pulled together by the white gold case and accents. So go ahead. Choose Patek and celebrate the wonders of life. Our watch comes complete with original box, papers, and pusher.